Sometimes the excitement of a vacation in the Smoky Mountains can cause anyone to make spontaneous decisions about their lodging. At Aunt Bug’s Cabin Rentals we know you are mentally ready to fast forward time, so you can feast your eyes on the beauty and serenity of the mountains in Gatlinburg. In that case, we want to help you get to your vacation quicker, but also help you pick the right lodging for you and your group. Our 4 bedroom cabin rentals in Gatlinburg TN are great for all types of vacations in the Smoky Mountains, and we have several amazing ones to choose from. Use these steps for finding one, and you are sure to have the perfect lodging for your vacation. Our 4 bedroom cabin rentals in Gatlinburg TN have several different options for locations in the city. With all of these options you can choose one that is closest to the most important things to you. We have 4 bedroom rentals located near Ski Mountain, Great Smoky Mountains National Park, downtown Gatlinburg and the arts and crafts community. It is important to know how many people you need to accommodate because a 4 bedroom cabin can sleep a wide range of people. Our 4 bedroom cabin rentals at Aunt Bug’s have enough space to comfortably accommodate as many as 20 people, and as little as 8. We have a wide range of amenities available for each of our cabins, including our 4 bedroom rentals. You will find common everyday amenities for those who prefer the basics, and you will also find unique amenities for those who like a little luxury on vacation. All of our cabins come with a full kitchen, furnishings, decor and linens. You will also find each of them have something more to offer as well. There are quite a few options available for views in a 4 bedroom cabin rental. Not to mention we also have cabins that are secluded, semi-secluded and ones with closer friendly neighbors. Our cabin view options consist of monument views, mountain views, wooded views and ridge top views. This 4 bedroom rental has 3 separate bathrooms for its guests, and large spacious rooms. A Wonderful Way’s amenities include: a Jacuzzi tub, gas fireplace, hot tub, resort pool access, cable television, foosball, pool table and internet. *This cabin is pet friendly. Bearfoot Lodge is a beautifully decorate 4 bedroom cabin with 4 bathrooms. It features a game room with shuffleboard, arcade games, darts and more. Some of its other amenities include: a jacuzzi tub, gas fireplace, hot tub, cable television and a dvd player. Happy Days is a beautifully decorated chalet with 4 bathrooms. It is stocked with several awesome amenities to accommodate any large group. Some of those amenities include: a gas fireplace, pool access, tennis court access, a charcoal grill, two hot tubs, cable television, foosball, a pool table, air hockey, darts and wifi. *This cabin is handicapped accessible and pet friendly. Eagle’s View is one of our 4 bedroom cabin rentals in Gatlinburg TN that features a stunning mountain view for all of its guests. However, that’s not all. This gorgeous cabin also has a bbq grill, a gas fireplace, a Jacuzzi tub, a hot tub, resort pool access, cable television, foosball, a pool table, air hockey and wifi. 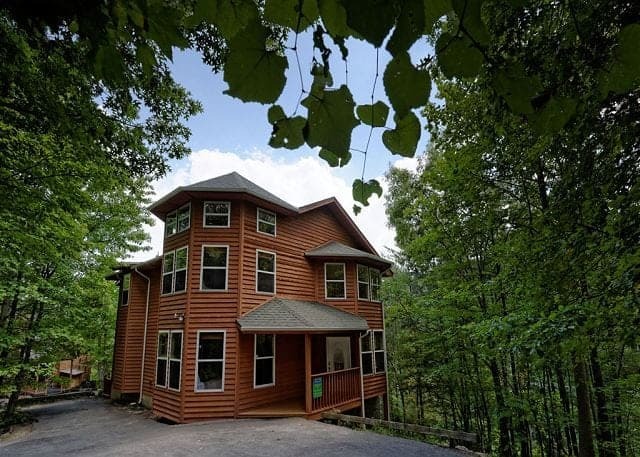 This spacious 4300 square foot cabin in Gatlinburg has plenty to offer its guests. With all of its space, The Pioneer was perfectly made for any large group or family retreat. Some of it’s amazing amenities include: wifi, a pool table, satellite television, a hot tub, a bbq grill and a gas fireplace. *This cabin is handicapped accessible. If you enjoy a nice swim, Bear Splash is a great cabin for you. It features its own private indoor swimming pool! You entire group will love the pool and all of the other features it has to offer. Some of those features include: a Jacuzzi tub, an electric fireplace, a 50 inch Smart HDTV, a gas grill, a hot tub, a pool table and wifi. Before booking one of our amazing 4 bedroom cabin rentals in Gatlinburg TN, make sure you check out our money-saving cabin specials to get a great deal on your favorite rental!